It’s finally spring! You know what that means: it’s time for spring fence maintenance. Your fence can take quite a beating over the course of the unpredictable winter, making spring fence maintenance and absolute must. Your fence spends the winter exposed to wind, rain, snow, unstable temperatures, freeze-thaw cycles, and underground shifts. It is important to spend time on spring fence maintenance and give your fence a little TLC so it can look its best and maintain its integrity long term. If your fence is used for a number or safety or protection applications, this is about far more than looks and getting started on your spring fence maintenance early may even prevent unfortunate emergencies. 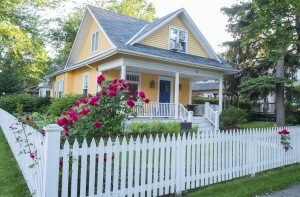 To discover spring fence maintenance tips, tricks, and strategies, read on. Depending on the extent of your fenced land, walk or drive along the full length of your fence slowly and carefully while checking for damage and have your tool kit on hand. Should you see any larger problems which require the help of a fence repair professional, make note of them so you can easily guide them to any issues. Rotten wood is the number one thing which leads to wood fence damage and requires immediate repair. Fencing that only has minor dirt or debris stuck to it from winter storms can be easily cleaned with a garden house. A power washer can be used to get rid of serious deep stains, rust, or discoloration on different fence materials. Make sure you know how to use the power washer before applying it to your fence, and that using one will not void your fence’s warranty if your fence is still under warranty. After washing, dry your fence before you repair or paint it. This entry was posted on Friday, April 22nd, 2016 at 6:44 pm. Both comments and pings are currently closed.